When considering bedding for your pet guinea pig, you have several options to choose from. The pros and cons of each should be evaluated by looking at the size of your cage, price and the ease of cleaning. It's comfortable for your Guinea pig. Absorbs liquid and can easily be washed and used again, which saves money compared to bedding you must replace and buy again. Once a guinea pig has eliminated on them, the odor will be noticeable. They can be cleaned by tossing in your washing machine but be aware that you'll have to hand scoop out feces first. Attractive with many color and style options to fit your taste. They are made with an absorbent layer to capture your pig's urine. Fleece guinea pig bedding has a very good track record for odor prevention and control and even when a pig soils it, you can wait several days before cleaning. A fleece pad is more expensive, and you'll probably want to buy at least two so you have a spare while washing the other. A pad can run from about $28 to $120 depending on the size of the cage and the quality of the fleece and lining. On the flip side, because it's reusable, you may find it's a much cheaper option over the lifetime of your guinea pig. It's also easier to clean than other types of shavings as there's no messy debris to fall out on your furniture and the floor. However, like cotton bedding, you will have to scoop out the pig feces on your own before removing the fleece for washing. Hay is a good, cheap option for bedding that also doubles as nutrition for your Guinea pig. One problem with hay is that since your pig will enjoy eating it, you'll need to keep a clean area for eating hay that lifts it off the cage floor. Hay is not very effective at controlling odor, so you'll need to clean any waste in the cage daily. Paper bedding is a good option for guinea pigs as it absorbs odor well and is a comfortable surface for your Guinea pig. You can find paper bedding in several forms such as granule paper pellets, natural paper shavings, unbleached shaved paper or confetti. Some owners, however, find that paper bedding does control odor well, is dusty and becomes wet and damp quickly. Another form of paper bedding you can use with Guinea pigs is Yesterday's News, which you'll find in the cat litter section of your pet supply store. It's made from recycled newspapers. It's lower in cost than other bedding types and is 97% dust-free. Most are lower cost than other types of bedding. They can help with removing odor although they can have a strong odor of their own which some people may not like. 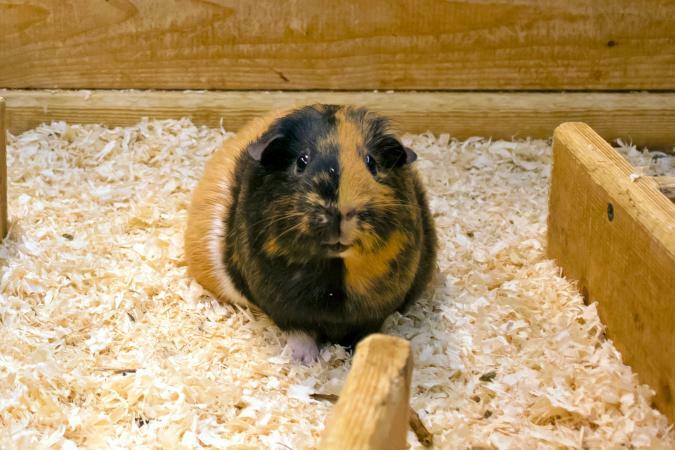 Pine shavings contain volatile oils that may have a negative effect on your guinea pig's health. Some pigs, and even people are allergic to it. Aspen shavings have less oil than pine shavings, but they are more expensive and harder to buy. Wood pellets are hard to find and uncomfortable to walk on. It's a sustainable resource, so it's good for the environment. It's very absorbent and is effective for reducing the smell from the cage. It's dust-free which is good for you and your pig. Hemp bedding is also very soft and makes for a pleasant resting place for Guinea pigs. Carefresh Shavings Plus is a popular product for guinea pig lovers. It is composed of shredded recycled cardboard, wood pulp and shaved wood. It is known for doing an excellent job of controlling the odor of a pig's waste. Metropolitan Guinea Pig Rescue recommends making a mixture of Aspen shavings and paper bedding. GuineaPigCages.com recommends a similar mix but prefers a mix of three parts Aspen and one-part Carefresh. If you can't find Aspen, they recommend pine. You can line your cage floor with shredded newspaper and top this with a covering of hay. This will give you the benefits of hay with while the paper will absorb odor. In addition to types of bedding you shouldn't use, it's also important to never leave bedding that's wet or damp in the cage as this can affect their health. And always use some type of bedding. Making your Guinea pigs walk on plain plastic wire floors is very tough and uncomfortable on their feet. What's the Best Bedding for a Guinea Pig? As a new Guinea pig owner, it's good to know you have lots of options when choosing the bedding for the cage. Think about how often you'll be able to clean the cage and how important odor control is for you, as well as your budget, to pick the one that works for you and your pet.